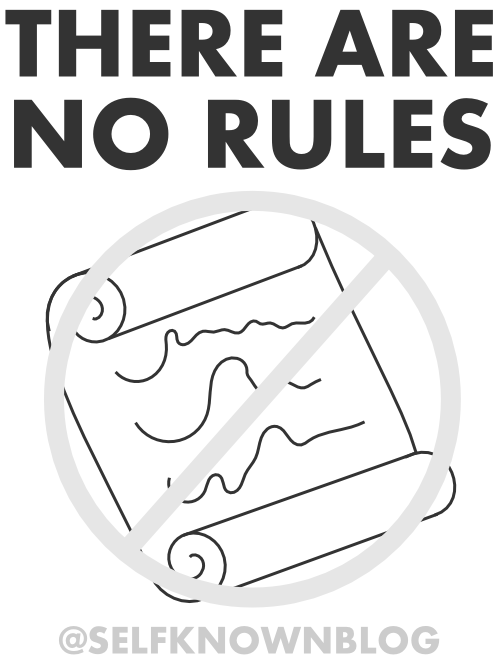 Something that's been a recurring message in my life is that there are no rules. Living isn't supposed to be fit into a mold. You don't have to go to the mall or write 2500 words a day or even brush your hair. But I find myself prioritizing these because, well, I thought I was supposed to be doing them (though, the brushing of my hair could be viewed as a worthwhile use of my time). In reality, I don't have to do anything I don't want to do. When it comes to choosing what you do, who you spend your time with, and what you get out of life, there are no rules. There may be outside expectations, dreams, realities and conflicts, but overall, you get to choose your path. I know it's not as simple as that, but simplifying it allows you to see the whole picture. So if I feel this way, why do I do half the things I do? Why do I put myself in social situations that give me anxiety? Why do I get out of bed at 6:40 in the morning, when I know I could sleep in until eight? Why do I push myself, when I could ease up and go about it the easy way? I don't want it easy. Okay, sometimes I do. But not completely. I don't want to live a life that wasn't fought for. I don't want to wake up and realize all my opportunities have vanished. That I gave myself unnecessary rules and couldn't have enough self-discipline to be diligent and productive in my dreams. Reaching out, standing up and conquering fears - that's what life was meant for. Acquiring passions, finding love and pursuing dreams - that's what I want to do. This is so awesome! I totally agree with you. I nominated you for the you are amazing and so is your blog award! This post is spot on perfection. Sometimes late at night when I am bored and can't sleep I think about stuff like this. I think about this allot, and have to say I agree with you in so many ways. Thank you for having a logical brain. Whenever I go to an event where I won't know anyone, or somewhere where I'll have to be alone and interact with people I don't know I get super anxious, but I tell myself that it'll be good for me and help me get over being afraid of social situations and that kind of stuff. Usually it's awkward, but never the disaster I dreamed up. We should all try to do thing we want to do, even if we're not comfortable with the situations or getting what we want is hard.